Day 17 - Prayers Going Nowhere? Do you ever wonder if your prayers are having any effect? 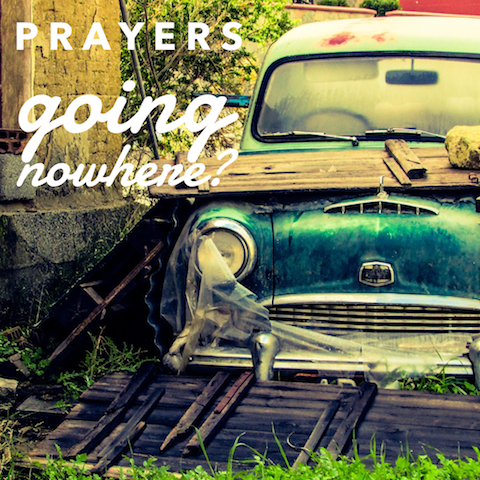 Could it be that our prayers are just bouncing through the air without completing their mission? How could that be? The prayers of a person who is in right relationship with God are powerful and will hit their target. If you feel like your prayers are falling flat, check into your relationship with God. The more intimate, close and "right" you are with God, the more your prayers will pack a powerful punch. The one walking closely with God… walking in humility and the fear of the Lord has the amazing privilege of seeing God move mountains through his prayer. God does not want our prayers to be ineffective. He longs to partner with us in bringing his kingdom to this earth. When you are walking in righteousness, you have God's guarantee that your prayers will be powerful and effective. God sees what man does not see. He notices the quiet whispers of a longing heart. He recognizes the silent pleas of desperate soul. Nothing goes unnoticed with God. He is present. The Pharisees of Jesus' day wanted men to notice their prayers. They were more concerned with human applause than with God's intervention. That's why Jesus makes a point of telling his followers that God hears their secret prayers. Jesus is always more interested in our heart than our public display of loyalty. When it seems like you are alone and no one is listening, God is. Pour out your heart to him in the secret place. He will hear you and reward you. That's his promise. His presence and breakthrough are on the way. Don't we wish the process of prayer was like cooking in a microwave? Press a button, and thirty seconds later, your food is cooked. Why does it seem to take a lot longer for our prayers to take effect? Isn't there a simple button we can push? Prayer is a relational process. God desires to work with us in the fulfillment of his purposes for us. He does not leave us as bystanders as he moves with power throughout his kingdom. As we pray, pray and pray again, our spiritual muscles are expanding. God is growing us and growing the answer to our request at the same time. Our faith gets stretched as we persevere. This perseverance "must finish its work so that you may be mature and complete, not lacking anything" (James 1:4 NIV). Added to that, perseverance in prayer is required to deal with the forces of darkness opposing you. God is not hard of hearing. Sometimes, an answer to prayer comes quickly. Often, perseverance is required. So, don't give up. Keep asking, seeking, knocking. Keep praying, believing that every breath poured out to God is valuable and is moving his hand to action. Thanksgiving in prayer is vital for the power of God to be released. It should never be considered an optional extra in our prayer lives. Thanksgiving draws faith out of our prayers. And faith is necessary to please God and gain his reward (Hebrews 11:6). Paul consistently thanked God for the churches that he cared for (See Rom. 1:8; 1 Cor. 1:4; Phil. 1:3; Col. 1:3; 1 Thess. 1:2; 2 Thess. 1:3; 2 Tim. 1:3; Philemon 1:4). Paul's relationships with these churches wasn't always conflict-free. He often had to bring strong alignment. But he always thanked God for them. In fact, he didn't stop giving thanks. When does your thanksgiving stop? When someone annoys you, can you still give thanks for them? When a friend offends you, will you choose to give thanks? This type of thanksgiving is a choice to be obedient to Jesus. He said to us, "And whatever you do, whether in word or deed, do it all in the name of the Lord Jesus, giving thanks to God the Father through him" (Colossians 3:17 NIV). Is prayer a duty for you, or do you know the joy of prayer? Prayer becomes a job to do or a task to complete when we forget the One we are talking to. The more non-relational your prayer life is, the more lifeless it will become. Paul prays with joy because he is confident in God. He is confident that God is actually responding to him and actively answering his prayers. Paul is confident that God always keeps his promise - his promise to complete the good work he started. 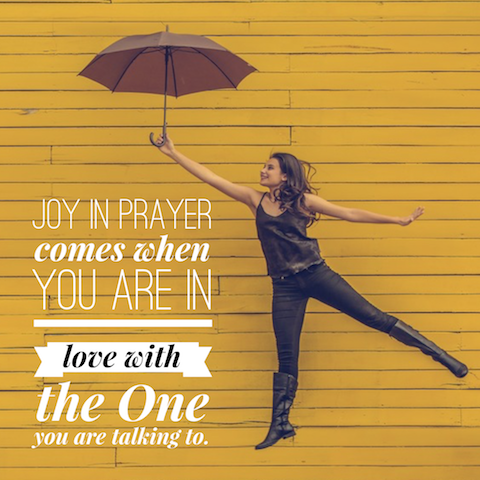 Joy in prayer comes when you are in love with the One you are talking to. Just the fact that you are together talking almost means more than what is actually said. Joy is birthed out of the love relationship with God. Joy is then communicated in your conversation. Do you look forward to your special conversations with God? Do you anticipate his presence with joy? This is the life he has called you to. This is the prayer life that can be yours. Do you have a sense that you should share the good news of Jesus with those around you? Do you sometimes lack courage to speak out? What was the secret of boldness for the disciples in the book of Acts? The Holy Spirit. How did they access the power of the Holy Spirit? Prayer. It is in prayer that we communicate with the Holy Spirit. We express our love. He responds. And he gives us power for evangelism. Although they already spoke the Gospel with courage, the disciples still asked the Holy Spirit for more boldness. 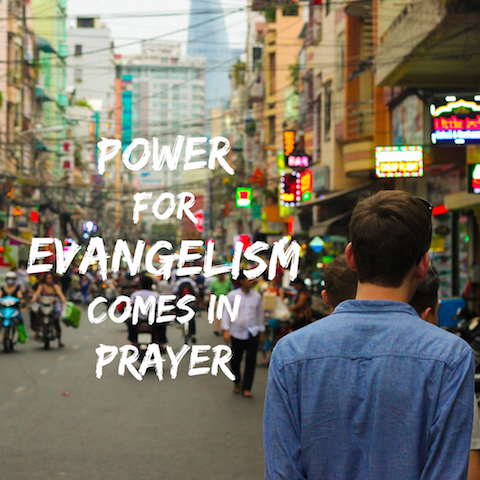 Paul also asked the Ephesian church to pray that he would be fearless in his evangelism (Ephesians 6:19). If you want effectiveness and power in your proclamation of the Gospel, ask for it. Pray for boldness. Pray for power. The Holy Spirit will certainly respond with evangelism opportunities and courage for you to speak. 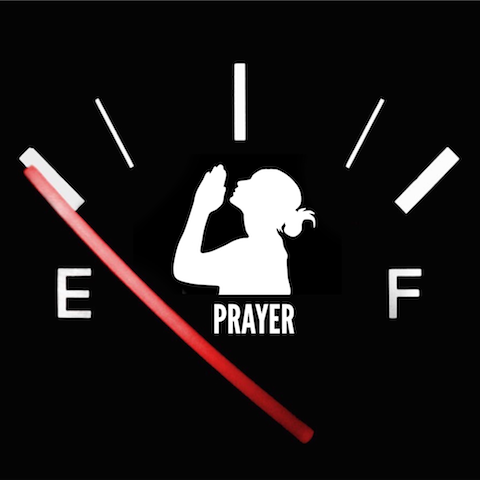 Prayers running on empty? How do you pray meaningful prayers that God will respond to? In the parable of the Pharisee and the tax collector, Jesus highlighted the prayer of the tax collector as the meaningful prayer. The Pharisee's words were empty. What was the difference? Humility vs. Pride. When prayers are spoken to make someone look good or as a religious form, pride has entered in. There is always an empty ring to the proud prayer. That is not a prayer that God will respond favourably toward. Pride always reverts back to self. So too, proud prayers will revolve almost exclusively around the speaker's personal world. Are your prayers full of humility? God will be sure to respond to you. For "God opposes the proud, but gives grace to the humble" (1 Peter 5:5). Humility in prayer is reflected in language that recognizes clearly who God is, and that you are not Him. The humble prayer is one that is filled with worship (God-directed) and intercession (prayer for others). It is fine to pray for yourself, but let the bulk of your prayer life be directed away from self. Be open and honest before God in prayer. These are the humble prayers that please God's heart. "Saul… did not inquire of the Lord." We are taught as children to dress ourselves, feed ourselves and work for our own money. Often we are taught that the goal of life is to be self-reliant. Independence is raised up as one of the highest values of life. How did Jesus, the Creator of the universe, live on this earth? Jesus says, "… the Son can do nothing by himself; he can do only what he sees his Father doing, because whatever the Father does the Son also does." John 5:19 NIV Jesus is completely dependent on his Father. There is no self-reliance in Jesus, the King of Kings. Who are we to think that we could do it on our own? King Saul thought he could do it on his own. He consistently did not inquire of the Lord. His self-reliance manifested itself in prayerlessness (1 Samuel 15 and 28). And his end was destruction. 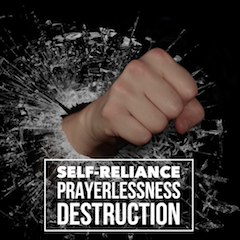 Self-reliance leads to prayerlessness, which leads to destruction. Resist the temptation towards self-reliance by pausing often through your day to intentionally listen and talk to God. Live like Jesus, not Saul. 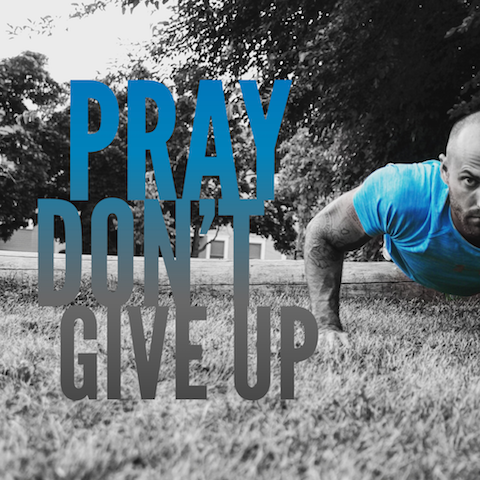 How active is your prayer life? Do you use all tools available to hear God's response? He waits to listen to your voice. He wants to be found. He longs to open up the door. That's his promise. Often when we pray, we are put off when the "answer" does not quickly appear. Today's encouragement from God's word is to use all that you have been given to hear God. Keep using your mouth to ask and enquire of the Lord. Seek his truth in the Bible. Reach out to "knock" on opportunities to hear God's voice through trusted Christian friends, times of worship and quiet reflection. God has promised that you will receive revelation from him. He always keeps his promises. And God loves to involve you in the fulfilment of his promises. That's why he tells you to get active - ask, seek and knock. And don't stop. He will surely make himself clear to you. Pray without ceasing. Pray continually. Never stop praying. Sound like an impossible mission? Can you do this? In another passage, Jesus says to "remain in me, as I remain in you" (John 15:4). He is referring to a relationship between himself and his disciples that is much like a branch remaining attached to a vine. There is not a constant connecting and disconnecting process through the day. The branch stays or remains in the vine. If a branch does not remain in the vine, it will wither up and die. Constant prayer is like a branch remaining in the vine. Your relationship with Jesus can be one of intimacy where his words are pouring into you and your words are pouring back to him. The connection between Jesus and you can always be open. This is made possible by his act of intercession on the cross. But, this connection is kept active and alive through your conscious choices to remember him… to listen, to speak, to worship and thank him. Your intentional choices to surrender moments of your day to listen, worship, ask and love Jesus will add up to a life of constant prayer… a life of remaining in him… a life where the connection between you and God is always open. This is a life that produces great fruit in your character and your ministry. Jesus looked out on the crowds of people gathered before him. They were desperate and hurting… such incredible need there before him. Jesus was moved to compassion. He felt the pain of the crowd deep in his spirit. What did Jesus' compassion move him to do? Pray. Pray for what? Pray for more missionaries… more people who would reach out and minister to these hurting ones. One would think that Jesus, as God in the flesh, would simply sort everyone's problems. But, Jesus said that more missionaries would be needed to gather in the harvest. He wants us to be involved in his purposes! Our gut response to overwhelming need is often to do nothing or try to do everything. But Jesus tells us to pray. When we pray, we understand what our role is in the moment. When we pray for missionaries to come, we multiply ministry. Prayer unlocks the ministry and power of the Spirit to the multitudes. So partner with Jesus today, as you pray for more missionaries. Who knows - you might become the answer to your own prayer! Jesus died on the cross and rose from the dead. In doing this, he disarmed the devil, stripping him of authority (Col. 2:15). Jesus then shared this authority with his church. He gave us the keys of the kingdom to call heaven down to earth. Our intercession in prayer activates this authority. As God leads us to stand in the gap and pray for a given situation, people group or community, we are called to "bind" the works of the enemy and "loose" the Holy Spirit into that situation. This is how we activate our authority. 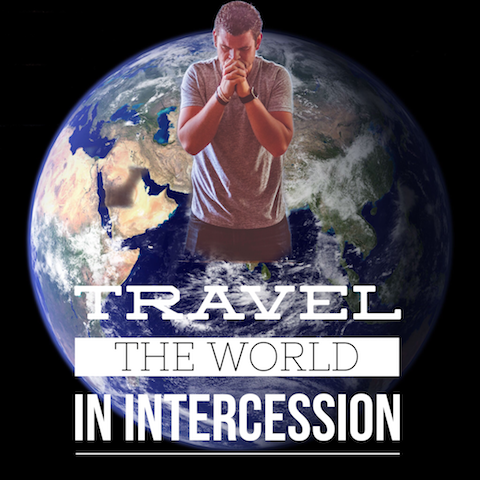 As we follow God's leading to pray for peoples and nations, we can travel the world in intercession. And this type of traveling is not a holiday. We engage in a real battle in the heavenly places that has specific and timely impact in our world. Our intercession actually makes a difference! 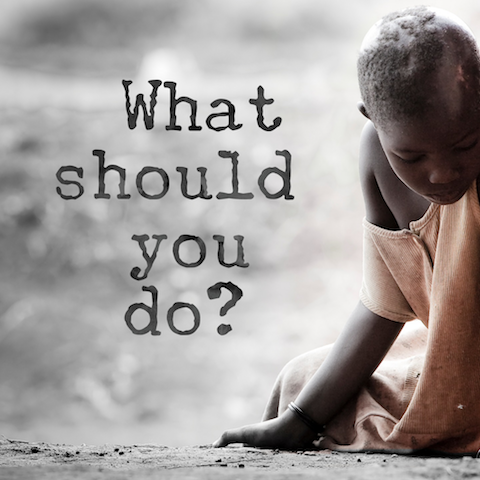 As you read the news today, take a moment to ask God how you can intercede for those involved in that current event. Take up your authority to push back the enemy and bring God's presence into nations and situations far from your home. Travel the globe with God in intercession. 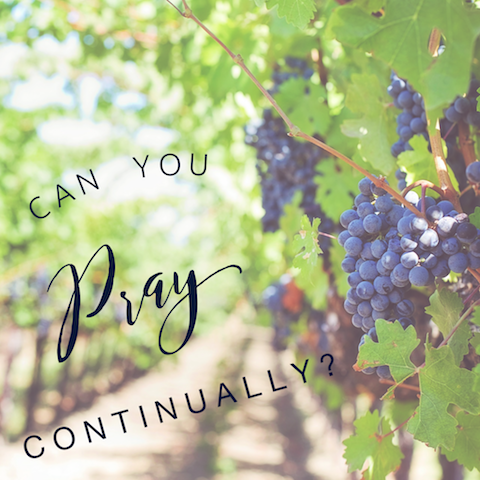 Have you prayed the same prayers for too long? Find yourself rehearsing phrases that you've repeated for years? God wants to put a new song in your mouth. The Psalms are full of prayers to God set into songs. 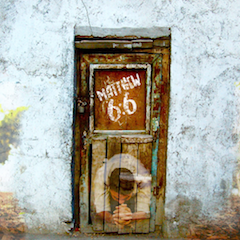 David found a new song, a new prayer, when he was set free from his dire circumstance. A new reason for thanksgiving precedes a new song. A full heart of gratitude will burst out in new prayers to God. Lifeless, repetitious prayers indicate a self-focused gaze. Philippians 4:6 says to present your requests to God with thanksgiving. And that's when his peace will come. Thanksgiving in prayer brings freshness into our spirit and mouths. The thankful heart becomes the most creative heart in developing new ways to express worship to God. 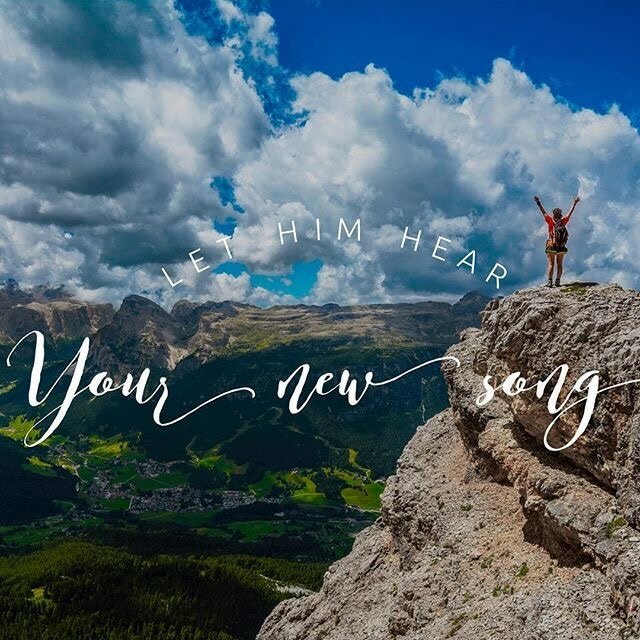 Try singing a new prayer. Think of something you are grateful for that you haven't spoken about for awhile. Ask God to put a new song in your mouth. Then open your mouth and start singing. 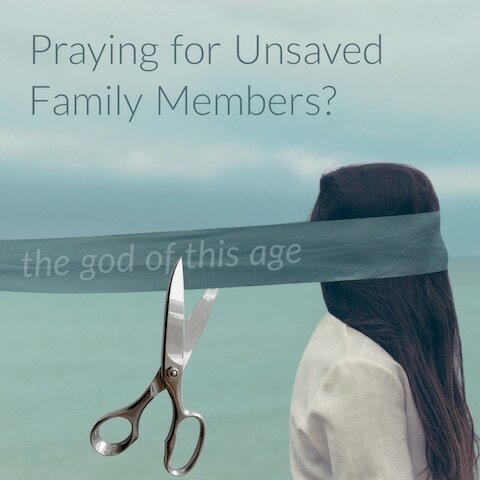 Do you have family members that are not saved? Have you been trusting God for their salvation for quite some time? Don't give up. Keep praying. 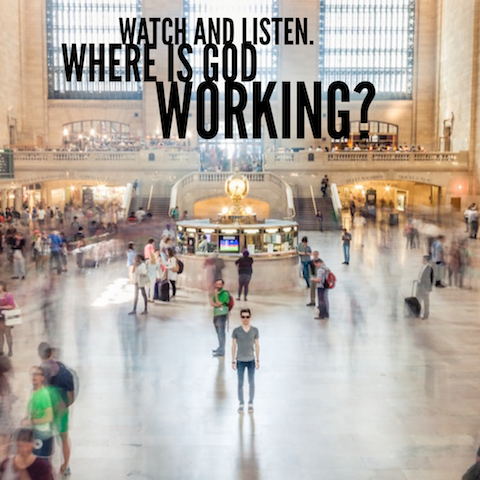 God is listening and responding, even when you can't see his obvious movements. God is patient with your family member, not wanting them to perish, but rather repent and be saved (2 Peter 3:9). Their salvation is His desire. Therefore, we can have confidence in our prayer life… "that if we ask anything according to his will, he hears us. And if we know that he hears us–whatever we ask–we know that we have what we asked of him" (1 John 5:14-15 NIV). So keep praying. God is listening and responding. It is important to pray that our unsaved family member will see and hear. We should cut off or bind up "the god of this age that has blinded the minds of unbelievers so that they cannot see the light of the Gospel" (2 Cor. 4:4). ​Also, pray that your family member will hear the good news. "How, then, can they call on the one they have not believed in? And how can they believe in the one of whom they have not heard? And how can they hear without someone preaching to them" (Rom. 10:14 NIV)? Wait, then take God's opportunity to speak about Jesus. In the meantime, keep praying over the eyes and ears of your unsaved family member. Trust that God is on the move! ​We often run out of words when we pray. Mere language cannot express the longings of our hearts. But, do not worry. 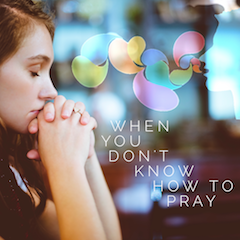 God knows that we don't always know how to pray. He understands our limitations. He groans with us and on behalf of us. When we don't even know what we really need, the Holy Spirit knows. He actually prays for us. Claim this promise for yourself and those you pray for. The Holy Spirit is already interceding for you and them according to God's will. He is praying the perfect prayers. Trust him and pray in communion with him. Do you ever feel alone in your prayer life? Feel like you are carrying burdens that no one really understands? The truth of God's Word is this: you have two intercessors covering you. The Holy Spirit is interceding for you according to God's will. 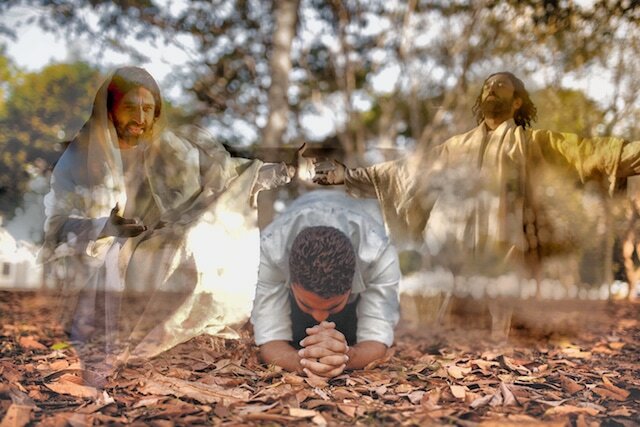 He knows the perfect way to pray for you, and he is doing it right now. Jesus, also, lives to intercede for you. He is at the Father's right hand talking about you. What would they be talking about? They are speaking of their love for you… how thrilled that you can be in their family, all because of Jesus' intercessory work on the cross. The intercession of Jesus happened 2,000 years ago on the cross and is being applied to your life today, because Jesus lives. He is for you, not against you! Be led in prayer by the greatest prayer warriors, the Holy Spirit and Jesus. Listen for his promptings in prayer and watch the answers appear. There is a prayer that pleases God - a prayer that he responds to - the prayer of faith. There is a prayer that God does not reward - the prayer of unbelief. 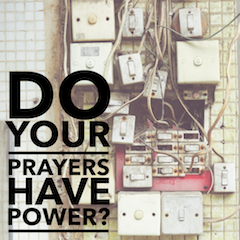 How can you be sure that your prayers hit the mark each time? Take another look at the verse above. It all starts with believing that God is… that he is alive and active on your behalf. If there is a question on this point, you will feel the need to take on God's role. And that's where the trouble begins. But the starting point of God's character - his power and authority in your situation lays the foundation for the breakthrough ahead. The prayer of faith then continues with a commitment to gain God's reward. He has promised to reward those who earnestly seek him. This fierce tenacity in prayer is motivated by the promise. Go out and grab hold of God's promise. This is the prayer of faith. James 5:15 says "the prayer offered in faith will make the sick person well." Faith is the key for effectiveness in prayer. It is faith that acknowledges who God is. Faith determines to keep praying, to keep pressing for the reward. It is faith that pleases God. What are your greatest tools in prayer? Your eyes and ears. Jesus - the Creator of the universe - said that he does nothing by himself. He only does what he sees the Father doing. In other words, Jesus watched and listened before ministering. When you pray for someone, do you just start speaking words that you hope will be beneficial? Or do you wait for a moment, asking the Father to show you what he is already saying and doing? If you think that you are starting the ministry moment, then you will think you need to finish it. But, if you realize the truth that God is already working, you can simply ask him what your role is. Practice asking the Father how you should pray before you start speaking. 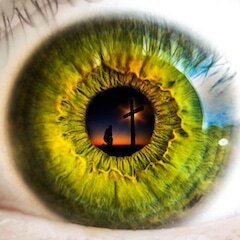 Ask him to help you see with spiritual eyes what is really going on in a person's situation. As you begin praying, continue to check back with the Father as to his leading. This is how Jesus worked with his Father. Where is Jesus seated right now? At the right hand of the Father. What does that mean? Jesus is seated on the throne, a position of honor and authority next to his Father. According to the passage above, where are you? You died, and your life is now hidden with Christ in God. That means you are in a position of authority in Jesus. We are told to set our hearts and minds on this truth. Why is it important to fix our gaze on this truth? We are called to live and pray out of a place of authority. Do you ever find that you whine at God in your prayers? Do you pray out of a place of hopelessness and weakness? How does that line up with the true picture that you are seated in a place of authority in Jesus? We are called to speak and declare our prayers in the authority of Jesus. We have been given the keys of the kingdom to bind and loose on earth as it is in heaven (Matthew 16:19). In other words, we have authority to call heaven down to earth, to declare God's rule over this world. Be done with passive praying. 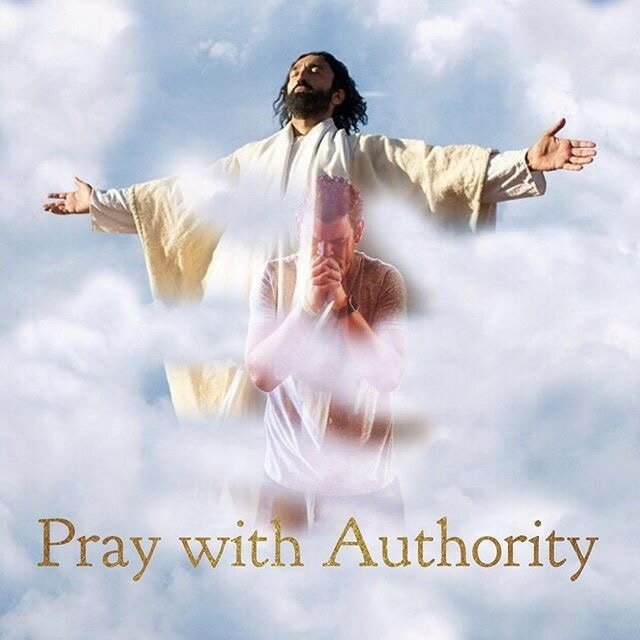 Take up your authority today in prayer as you partner with Jesus in bringing his kingdom to this earth. Everyone has an opinion about their leaders. It is seen as fitting and normal to judge and critique those in authority. But do we follow Jesus' command and pray for them. Our leaders will govern most effectively when the church is praying for them. Have we ever thought that problems in government are sustained through a prayerless church? This Scripture also tells us to give thanks for our leaders. Does thanksgiving characterize your conversations regarding your leader, no matter what political persuasion you have? Turn from complaint and judgement. 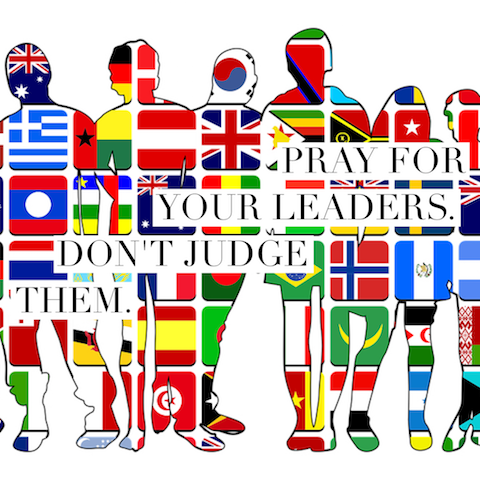 Take time today to thank God and intercede for your national leader and the leader at your work place.